Consumers beware of a scam from a company called Web Listings Inc. they are trying to trick you in to thinking that you need to pay / register your domain name with them. I received an envelope in the mail that seemed to be an invoice for one of my domains names. 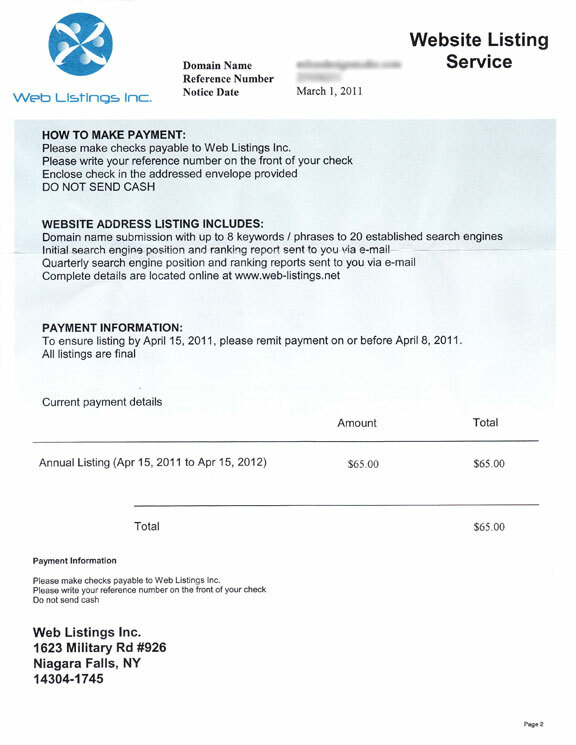 When I opened it up I found a bill for $65.00 from a company called Web Listings Inc., offering domain name submission to 20 established search engines, up to eight keyword/phrase listings, and a quarterly search engine position and ranking reports for 1 year. As you can see in the images below, the intent here is to fool the consumer into thinking that it is, in fact, an invoice that needs to be paid. Web Listings Inc. is sadly preying on unsuspecting domain owners in hopes they can get you to pay $65.00 of your hard earned money when you can register a domain name for only $9.99 from KissMyDomain.com who I have all of my domain names and web hosting services through. Web Listings Inc. states that they will submit your domain to 20 top search engines. Sorry to break it to you guys, there are only 3 top search engines! If you received one of these fake invoices, our advice is to just throw it in the trash, or if you have a fireplace, burn it! 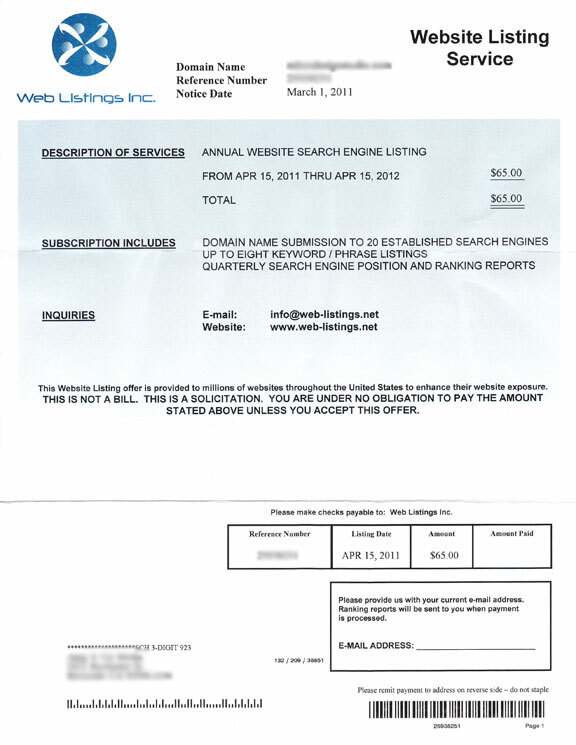 Web Listings Inc. uses dishonest tactics to try and catch unsuspecting people off guard. Their phony invoices are actually sign-up forms for a service that has absolutely no valid purpose for existing.